One of the main reasons the WAVE takes place every year is to educate people. The WAVE educates the general public on the fact that electric vehicles are here and usable today. But even more importantly the WAVE educates the next generation. School children are growing up in a world that is already changing radically. By the time they are adults everything will be different and teaching children about electric vehicles now will prepare them for the future where these cars will be the denominate type. Due to this, today the WAVE split into two groups, each one visiting a school to show the children the cars and talk to them about renewable energy and electrified transportation. Half of the WAVE went to a school in Hittisau, Austria, while the other half went on to a school in Wolfurt, Austria. The children got to look at the cars and even got to vote on the one they thought looked the best! The journey to get to the schools saw the WAVE teams travelling over Riedbergpass, Germany’s highest mountain pass at 1407m above sea level. At this point, assuming nothing got in the way, the teams on the WAVE would have been able to see up to 83 miles into the distance. Once the school children headed back inside to get on with their usual school day the WAVE moved on to Bregenz, Austria to visit the Evolution:m conference. This conference looked at mobility in all forms to find out ways in which they can be made greener and better for the world. We can’t think of a better advert for the realities of electric cars than the WAVE stopping by. Before lunch the conference took a short break to let its delegates have a look around all the various vehicles and talk to the teams. At this point a few of the cars needed some charge. 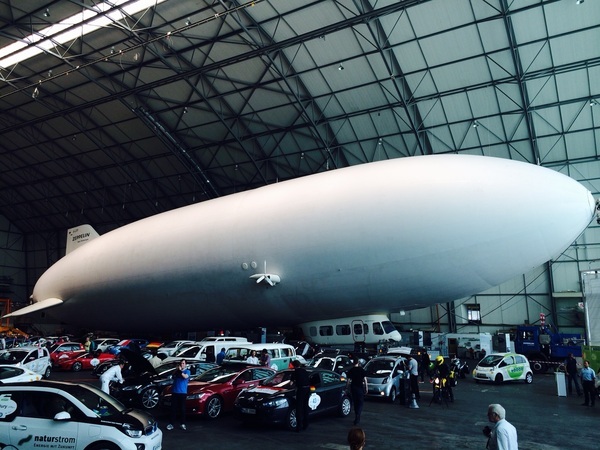 So where better to get some juice than to than to head to Friedrichshafen, Germany to charge up in the same hanger as a Zeppelin? Here the WAVE was welcomed by the city Mayor Andreas Brand and CEO of Zeppelin Thomas Brandt. This was followed by a short jaunt to Meersburg, German where a special ferry was put on to transport the WAVE to Konstanz, Germany. The ferry crossing was filmed by remote controlled drone. Once we get our hands on this video, we’ll add it to our daily updates. All the electric cars on the Ferry heading to Konstanz, Germany. If you have never been on the WAVE yourself, you may not know that along the way there are various competitions. Some are obvious like most efficient car and fastest charging car whereas others are less so. The competition held in Konstanz today was the comfort test. Judges sit in each vehicle and assess its comfort on a number of criteria. But don’t just think that because the Model S has leather seats it will win, some of the smaller cars and e-bikes can be surprisingly comfortable. We’ll let you know which team won this competition when the results are announced. The final part of today’s very active day is a trip to Mainau Island. Mainau is an island in Lake Constance. It is maintained as a garden island and a model of excellent environmental practices and they have allowed the WAVE teams to drive onto the island and park there! Chris Paine, director of Who Killed the Electric Car? and Revenge of the Electric Car will be doing a presentation in the evening before the WAVE teams get to go on a boat-tour test drive and then wander around and sightsee while the sun sets. We’re looking forward to seeing some amazing photos!